To those of us who have been planting maize for many years, many of the decisions are already second nature. We have done it so often we don’t need someone telling us what to do – and yet there are often things we overlook or neglect to pay attention to like small details which have the potential to dramatically affect the yield. And in today’s world of high input costs and tight budgets even a 300 kg/ha increase in yield could mean the difference between breakeven and profit. The accurate placement of seed in the soil cannot be overemphasised. Two farmers can have the same number of seeds per hectare, for example 16 000 seeds/ha – but Farmer No.1 uses a planter which places the seeds erratically, with some too close and some too far; while Farmer No. 2 has a well-maintained, efficient planter that spaces the seed at exact intervals apart for example, 34 cm. The second farmer can expect as much as between 500 kg to 1 ton more yield per hectare than Farmer No 1 because of the even placement of the seed in the ground. Make sure there are no worn out planter knives or discs, otherwise you will not get the desired depth penetration for seed placement. Old, stretched chains that “jump” over cogs must be replaced. New chains are a small price to pay for accurate seed placement. Check cogs which might have worn as a result of old or stretched chains and replace where necessary. Check all the bearings. Bearings wear out and need to be replaced from time to time or otherwise they need regular greasing for effective operation. A “sticking” bearing will cause the shafts to turn erratically and disrupt the frequency of the seed placement. Worn fan belts on vacuum planters must be removed and replaced as poor tension on a blower will not create enough suction to hold the seeds onto the plates. Be sure about the size of the holes for the seed in your plate planter. Incorrect seed size for the plate will also affect the stand (plant population). These are all possible reasons why a consistent stand is not realised. 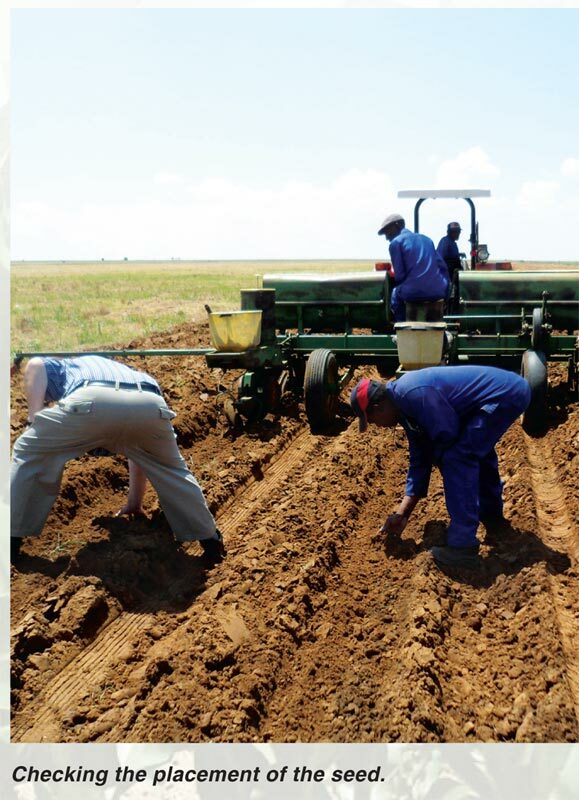 The maintenance and servicing of all other equipment, as well as the planter, to be used in the preparation and planting process is essential for a good stand. Accurate calibration of the planter is especially important these days as the seed which is used is very expensive and there should be no wastage. Choose your seed variety carefully. If you are going to plant a slightly lower population this year, don’t plant a variety that will only give one cob per plant, rather select a multi-cobbing variety which will compensate with more heads if it does rain well. It is occasionally a wise management decision to plant a lower population. It is important to scarify the soil 3 - 4 days following planting with a “Duisendpoot” to ensure that all the seeds in the ground will be able to emerge and push through the soil. This is especially important where one has planted in wet conditions because the sun bakes the earth which then forms a hard crust and traps the tender new seedlings under the surface. Be vigilant and ready to wage war on the weeds. Have a spray program in place which will ensure there is no competition for the seedlings. If no chemical sprays are applied either at the time of planting or immediately following planting, the weeds will grow too vigorously and make cultivation essential BUT this is highly risky as the seedlings are still vulnerable and easily dug out, so that plant population is compromised. Fertiliser is probably the most expensive production input of them all so it makes good management sense to service and calibrate all the fertiliser applicators at the same time as the planters are being serviced. This will ensure an even distribution of the fertiliser. Once again conduct a thorough inspection of all chains and cogs for wear and tear and service, grease or replace. It is also important to inspect all the small fertiliser augers (worms) and replace if necessary because these must carry the flow of fertiliser evenly and accurately to the outlets to ensure an even distribution of fertiliser. To avoid fertiliser burn on the new seedlings, it is necessary to place the fertiliser in a row at least 5 cm away from the maize seed and from between 2 cm - 5 cm deeper than the seed. Fertiliser which is either too closer or even on top of the maize seed can negatively impact the germination of the seed and so affect plant population. The planting of the crop is by far the most critical operation and demands extra planning and care but it is also just the beginning of the life span and potential of the maize crop. Attention to detail is essential from pre-plant right to harvest and management attention is necessary on a daily basis. It is the vigilant and diligent farm manager who ultimately reaps the rewards for his labour throughout the season.